What is an Optical Frequency Comb? An optical "frequency comb" is a very precise tool for measuring different colors—or frequencies—of light. The technology, made possible by recent advances in ultrafast lasers, can accurately measure much higher frequencies than any other tool. Frequency combs are already widely used in metrology laboratories and physics research, and they are starting to become commercially available. Optical frequency combs rely on the relationship between time—obviously a familiar concept—and frequency, which is less familiar to most people, but is simply the number of oscillations per unit of time. NIST scientists start with lasers that emit a continuous train of very brief, closely spaced pulses of light containing a million different colors. The properties of the light over time are converted to frequency numbers to make what looks like a comb. Time and frequency are inversely related; that is, smaller units of time (or faster oscillations of light waves) result in larger frequency numbers. 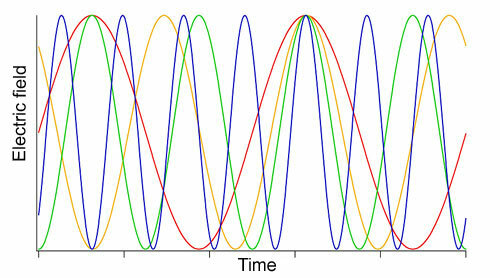 The graphic below shows how a few different colors of light oscillate over time. This example is greatly simplified, and the specific units are unimportant (in reality the units would be tiny fractions of seconds). The essential point is that the blue waves oscillate much faster than the red waves, and the yellow and green waves are somewhere in between. A simplified graphic of a corresponding frequency comb is shown below. Each "tooth" of the comb is a different color, arranged according to how fast the light wave oscillates in time. The waves that oscillate slowly (red) are on the left and the waves that oscillate faster (blue) are on the right. Frequency is measured in hertz, or cycles per second. An actual optical comb does not begin at zero on left, but at a very high number, 300 trillion hertz. A real optical frequency comb spans the entire visible spectrum of light, and has very fine, evenly spaced teeth. The teeth can be used like a ruler to measure the light emitted by lasers, atoms, stars, or other objects with extraordinarily high precision. The type of laser used to make the comb is critical to the precision of the ruler. The shorter the laser pulses, the broader the range of frequencies in the comb. NIST scientists use "mode-locked" lasers (see next paragraph) that emit femtosecond pulses lasting quadrillionths of a second, or millionths of a billionth of a second. The resulting comb spans several hundred thousand frequencies, or teeth, enabling flexible and accurate measurements of wide-ranging or widely varied phenomena. Mode-locking refers to how the laser light is formed into pulses. In all lasers, light is repeatedly reflected within a mirrored cavity. In a mode-locked laser, the peaks of the different colors of light waves coincide at regular intervals, evenly spaced in time. The peaks build on each other to form very short, bright bursts of light, each containing many different frequencies (see graphic below). The timing between pulses determines the spacing between the teeth of the frequency comb. NIST scientists use lasers that emit about 1 billion pulses per second. The faster the pulse repetition rate, the wider the spacing between the teeth, making each individual tooth easier to identify. Finally, the stability of the laser determines the width of the individual comb teeth. A highly stabilized laser produces very fine teeth, enabling highly precise measurements of specific frequencies or changes in frequency. Special crystals, mirrors, and other techniques also are used to make the light waves and comb teeth as perfectly spaced as possible. NIST has made a number of significant contributions to the development of frequency combs. Physicist John Hall of JILA, a joint institute of NIST and the University of Colorado at Boulder, shared the 2005 Nobel Prize in physics for contributions to the development of laser-based precision spectroscopy, including the optical frequency comb technique. For instance, Hall and colleagues developed methods to stabilize lasers and a "self-referencing" technique that ensures the comb teeth are in exactly the right places. This involves taking two measurements from different parts of a very broad comb and comparing the results to precisely known frequencies of an atomic clock. NIST physicists and collaborators were the first to compare the operation of multiple femtosecond frequency combs, thereby demonstrating reproducibility, and to verify that both the starting position of a comb and the spacing between the teeth can be controlled precisely. NIST scientists also have demonstrated the most precise synthesis ever of optical frequencies, generating specific colors with a reproducibility of 19 digits. The experiments are a significant step toward next-generation "atomic clocks" based on optical rather than microwave frequencies. NIST staff and collaborators also have extended the reach of frequency combs. One project extended the wavelength coverage 1,000 nanometers (a measure for wavelengths of light) farther into the infrared than ever before, while another effort at JILA created the world's first frequency comb in the extreme ultraviolet. 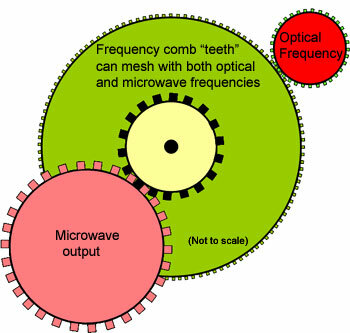 In addition, NIST has shown that extremely stable microwave signals can be generated from optical frequency combs. The electromagnetic spectrum spans from radio waves to visible light to gamma rays (not shown). Frequency combs have dramatically simplified and improved the accuracy of frequency metrology. They also are making it possible to build optical atomic clocks, expected to be as much as 100 times more accurate than today's best time-keeping systems. Better clocks will lead to studies of, for example, the stability of the constants of nature over time, and enable improved technology for advanced communications and precision navigation systems, such as next-generation global positioning systems. Today's best atomic clocks, and the international definition of the second, are based on the natural oscillations of the cesium atom, a frequency in the microwave region of the electromagnetic spectrum. Optical combs provide the equivalent of regularly spaced "gears" that can be used to link the slower "ticks" of microwave-based atomic clocks to the much faster, more precise "ticks" of optical clocks (see graphic below). Highly accurate measurements of frequencies are also essential for many other advanced fields of science that require the identification or manipulation of atoms or molecules, such as detection of toxic biochemical agents, studies of ultrafast dynamics and quantum computing. As scientists continue to improve frequency comb technology and make it easier to use, it may be applied in many other research fields and technologies, from medical tests in doctor's offices, to synchronization of advanced telecommunications systems, to remote detection and range measurements for manufacturing or defense applications. All clocks must have a regular, constant or repetitive process or action to mark off equal increments of time. Examples include the movement of the sun across the sky, a pendulum or vibrating crystal, or, in an atomic clock, the natural vibrations of atoms. Today's standard atomic clocks vibrate at microwave frequencies, about 9 billion cycles per second. Optical atomic clocks oscillate much faster, at about 500,000 billion cycles per second, and thus divide time into smaller units. But no electronic systems exist that can directly count these oscillations. A frequency comb, functioning like the electronics in a conventional clock, can be used to divide the oscillations of optical clocks into lower frequencies that can be linked to microwave standards and counted.